Landing page optimizations are updates advertisers make to webpages with the goal of improving performance and increasing on-page conversions. Landing pages need to be optimized and tested to serve their audience better. Businesses using pay-per-click (PPC) advertising should optimize landing pages to convert hard earned clicks into leads. Your landing page’s performance data is the key to making strategic landing page optimizations. Understanding your data and making effective optimizations can be a challenge if your expertise isn’t in digital marketing. Luckily, there are great optimization tools like Freshmarketer that can help you optimize landing pages without being an expert. Landing page optimizations are single updates made to an existing landing page based on your landing page’s key performance indicators (KPIs). The new landing page is then A/B (split) tested against the previous landing page to determine the effectiveness of your optimization. The landing page that performs better will be kept, and then continued to be optimized in other areas. Landing pages are very simple in structure, using minimal elements to better focus the page on your call to action (CTA), leading to more conversions. Even with a simplistic design, there is much that can be done to adjust and optimize landing pages from simple image changes to adjusting the messaging to reach your target audience better. Making minor adjustments can reveal a lot and improve on-page conversions greatly. To optimize your landing page, you will need to go to the platform where it was built, such as WordPress or platforms like Leadpages or Instapage. Using your ad’s performance data, select one part of your landing page to update. Duplicate your current landing page, and update the new landing page. From there, A/B test the old vs. the new landing page by creating ads that point to each. Monitor the results to see if the change made your landing page more effective. Optimizing landing pages not only drive more conversions, but it also can help improve your ad’s quality score. This can result in high ad rank on search ads, more frequent ad placement on social ads and lower (costs-per-click) CPCs on both search and social. Lower CPCs mean your existing ad spend will yield more clicks without a budget increase, squeezing even more conversions from your ad spend. Optimize your landing page by reviewing your existing landing pages data and analytics to discover areas that could use the most improvement, then make one change, test that change by A/B testing it against the existing landing page, collect performance data and finally review performance data to determine if the optimization was effective. Learn how to optimize your landing page strategically to improve your conversion rate faster with our easy-to-follow guide. Here’s how to optimize your landing page in five easy steps. If your existing landing page was built correctly, then you will have performance data and analytics tracking information available. Depending on where your landing page was created, the system itself may track performance automatically, or you may have used a Google Analytics tracking code. Go to the source of your analytics and review the data, looking at key performance indicators such as the number of on-page conversions, time on page, number of pages viewed or bounce rate. Compare these to your advertising goal to discover which aspect of your landing page needs the most improvement and start there. Here are the primary KPIs you should review. Conversions are the number one KPI for landing pages as they represent whether or not a user performed your desired action on page. Consider not only the number of conversions your landing page is receiving but your conversion rate, which is the percent of landing page visitors who convert on your page, to get perspective on the quality of your landing page. Example of A/B testing landing pages in Google Ads. Ad platforms like Google Ads and Facebook Ads give every ad a quality score, which includes analyzing your landing page to indicate how good your landing page is. Landing pages that are seen as irrelevant to your ad will have low quality scores. This leads to your ad being displayed less often and at a higher cost, so it’s key to be sure your landing page is highly relevant to your ad. Look at your quality score in your advertising platform (like Google Ads) to determine if your landing page is considered good based on how high of a score your landing page received. If your quality score is low, you’ll need to make it more relevant to your ad copy, such as aligning your ad copy and CTA to your landing pages messaging and CTA better. Quality score is an important factor in your ad’s overall success, so while it is over overlooked for landing page optimization, it should be monitored and reviewed. Google Ads gives advertisers the opportunity to see how Google ranks their landing page with ad relevance and landing page experience ratings, giving you further insights. Learn more about using Google Ads and how to create high performing ads. 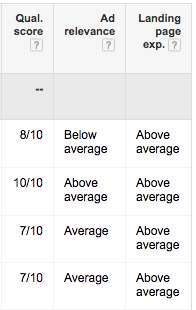 Google Ads quality score example. Google Analytics, as well as other analytics platforms, provide information on the average time a user spends on average on your page. Landing pages are meant to be short and straightforward in nature, but if you’re not seeing conversions and users are spending less time than it would take to read your page, then you have a problem. In this case, it’s likely that your landing page is designed poorly or feels like clickbait with a different CTA. If you’re seeing that users spend very little time on your page, it’s likely that there is an issue like one of the following: your page load time is too slow, landing page is not visually pleasing, offer is not the same as your ad’s, you require too much for a user to complete your CTA or the landing page messaging is weak or irrelevant. Bounce rate is how often users leave your landing page without going anywhere else. For example, if a user converts, then they end up on another page like a confirmation screen. Landing pages are not meant to include your standard website menu to lead users to click your CTA. However, if the majority of users exit the page instead of completing your CTA, then it’s time to review your landing page. In this case, it may be that your landing page is not what users had expected. The design could be completely different, throwing them off. Maybe your landing page is loading so slow users exit before it even appears. It could also be that your contact form has so many fields and appears daunting. A high bounce rate tells you that users aren’t seeing what they came for, and so they’re exiting the page without taking any actions or spending any time. If your page has a fast load time, start by looking at whether your offer and CTA match your ads. It’s likely that users feel like the ad was deceiving as the landing page doesn’t give them what the ad said it would. After reviewing your KPIs and determining which area needs the most help, decide which element you’d like to edit. Remember to make only one change or optimization at a time and ensure that changes are reversible should they not improve your landing page’s overall performance. Considering your data, consider whether or not your landing page copy reflects your advertising goals. Your messaging needs to correspond to your ad copy. But, even if it does, that doesn’t mean you can’t convey your message better. The written word can feel clear to the writer, but whether that message translates to the reader depends on their individual interpretation, meaning there is usually always room for improvement on messaging and landing page copy. Your headline is your first shot at getting the reader’s attention. Every user is in a decision-making process, and your headline should serve to remind them why they’ve gotten to your landing page to begin with and provide a reason to take your CTA. Use actionable language that speaks to your audience. Landing pages will typically either use a contact form made up of input fields or a process of clicking through to other pages. Either way, the more steps you include, the less likely a user will convert. A contact form with too many required fields can make a user feel like the cost of getting your CTA is too high, making it less likely a user will convert. You may use supporting text to strengthen your CTA. This helps support your headline, which should be fairly short and sells a user on the benefits of your offer further. Limit the amount of supporting text used on your landing page, making sure it’s concise and conveys your message without being too verbose. Optimizing landing pages is about testing new ways to reach your audience, so remember that you can test the tone of your landing page’s message. Let’s say your landing page is focused on the positive selling points. Instead, try changing the tone so that your ad maintains the same offer and CTA but, instead of using its positive selling points, speak to the customer’s pain points or reason to need your offer rather than reason to want it. The look and usability of your landing page hold the power to reinforce or compromise your brand image, trustworthiness and ad message, so getting it right is important. Solid landing page messaging needs to be supported by great design. It’s not enough to say the right thing to the right people — the message needs to be illustrated within the aesthetic of your landing page. Put yourself in the position of your viewer. What is their experience in looking at your landing page? Is the landing page responsive as in it adjusts to different screen sizes automatically or does it get cut off on certain devices? Is your offer clear and evident, and does it appear easy to receive your offer? Images often serve as emotional triggers for people, so consider what your image is evoking. It’s worth noting that there is a lot of research on image effectiveness. For example, images that include a smiling face tend to be more well-received, and images that lead the reader’s eye to your text leads to more user interaction. 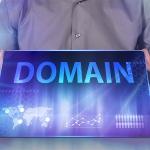 For example, a nursing home advertising on Google can use a landing page designed to capture leads with the CTA inviting users to come in for a tour. The site may think using a background image with the sun peeking through the clouds will be uplifting. However, this image may have a subconscious way of conjuring feelings of death and afterlife, instilling fears in people seeing a nursing home for a loved one rather than making them feel good about it. Color plays a role in subconscious perception. It’s well-known that blue makes people feel more trusting whereas red instills urgency and fear. However, it’s how these colors are used on a landing page that matters. Contrasting colors tend to work best in portraying a well-defined message, although primary colors can feel elementary or harsh in nature. Consider your business and your ad’s message to determine colors used in your image, text and CTA button. If your ads are showing on mobile devices, then you will need to optimize your landing page for mobile. For the most part, you will need to create a separate landing page designed solely for mobile as landing pages on mobile are designed differently. For example, on mobile, you have very limited space for text, meaning headlines must be very short, the CTA button needs to show without scrolling down, and it must be in a single-column format. Mobile landing pages come with a unique set of requirements and complexities, so we’ve written an article on just that. Learn more about the differences, capabilities and how to optimize mobile landings by visiting How to do Mobile Landing Page Optimizations. If your landing page doesn’t load quickly enough, then users will exit your page. Page load speed can make or break the success of your landing page. There are sites you can use to test your webpage loading time for free, such as Pingdom, which grades your page load speed to give you a better idea of whether your speed is good or not. 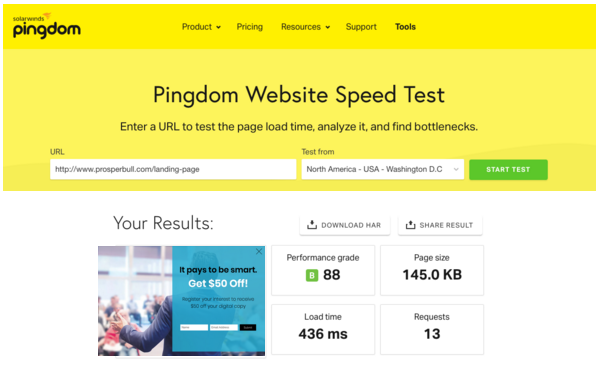 Test your page’s load speed with a free load speed tool like Pingdom to see how your landing page is doing. Not only does Pingdom gauge load speed, but they also provide you with a short performance report to give you a better idea of how your landing page measures up and potential areas of improvement. Pingdom landing page speed test example. Landing pages need to be optimized or updated for best performance. Don’t assume that your new landing page is necessarily improved. Start by using both your new and your previous landing page simultaneously to compare results side-by-side. It can be surprising what works and what doesn’t, so A/B testing new landing pages is your only real way to determine if your update was beneficial. Test your new landing over a period of time from as little as a week if you have a high volume of clicks to a month or more if you have low traffic volumes. Review and analyze the data, comparing each landing page to the other. Considering the data from the new landing page, determine if the one optimization you made was effective in reaching your advertising goal and driving more conversions. If the optimization was fruitful, use that as your base to continue optimizations. Get more details about how to test landing pages in our article on how to split test. A/B testing landing page examples. Give your new landing page time to collect performance data, then compare the data from each landing page to determine if the optimization was beneficial. If so, keep the new version, and repeat the process to continuously improve your landing page for increased conversion rates and a higher overall return on ad spend. Landing page optimization tools are available to help you take the guesswork out of landing page optimizations. They help make your optimizations more strategic and, therefore, effective in reaching your advertising goals. From easy-to-use A/B testing tools to customer relationship management (CRM) integrations that can upload your contact form submissions automatically to your CRM platform to informative analytics tools, you can optimize landing pages yourself. Analytics tools are how advertisers get behavioral information including time on page, number of pages viewed and so on. There are many analytics options available, all of which are embedded into your landing page to track users. Finding one that provides the right amount of information that is easy to understand is key to using data strategically for optimizations. Heap Behavioral analytics tracking for online businesses Free basic plan; upgrade to the enterprise plan for $299 per month. Tools are not required to A/B test landing pages, but A/B testing landing page tools make it easier to build and understand the results of A/B tests. This gives advertisers the ability to take the guesswork — and math — out of comparing the performance of two different landing pages linked to the same ad. There are a number of A/B testing tools available, but deciding which one is right for you depends on a number of factors such as where your landing page is hosted to whether or not you want to use a plug-in. If you’re using WordPress to host your landing page, then Google Optimize is a great option that is free. As always with Google, it has robust in features and data. Learn more about the best A/B testing tools. 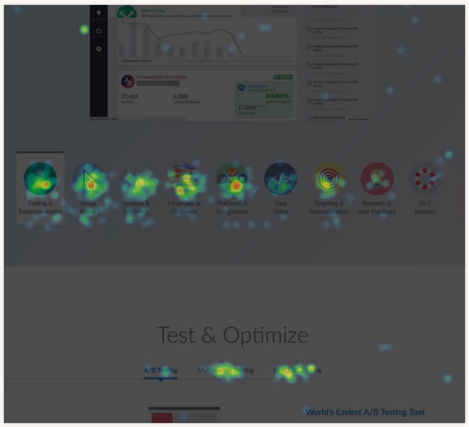 Heatmaps track user behavior on webpages and present information with a visual representation. They can help you understand what users are doing on your webpage better and which areas they’re spending the most time on. This information can provide insights into additional optimization opportunities. Sales funnels are your process of converting users into customers, and it is often overlooked in regard to landing pages. No matter how great your landing page is, it will struggle to convert users if you’re using a poor performing sales funnel. It can be difficult to understand if your sales funnel is affecting your conversion rate. However, there are sales funnel analysis tools that can help you find and fix sales funnel issues. Learn more in our article on funnel analysis. Be sure to keep landing page best practices in mind when optimizing. Adhering to landing page best practices will maintain the health of your landing pages, your ads and ad spend. Failing to do so can result in rejected ads and even advertising accounts being shut down. Landing page conversion rates vary greatly based on its design, messaging and value of offer. The average landing page conversion rate is 2.35 percent across all industries. However, the top 25 percent of landing pages convert at around 5.31 percent or higher. How Can I Find Someone to Optimize My Landing Page for Me? There are a number of ways you can find someone to optimize your landing page on your behalf. From digital marketing agencies to freelancers, you can find an expert to optimize for you. A great place to start is by going to Fiverr. There, you can find numerous industry professionals who you can hire for one-off tasks such as landing page optimizations at prices as low as $5. Is it OK to Use Videos for Landing Pages? Whether or not it’s acceptable to use videos on landing pages depends on which advertising platform you’re using. For example, it’s fine to use videos on landing pages for Google Ads. However, Facebook Ads has a policy against auto-play videos, making them a generally avoided media type. 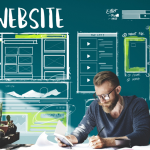 Optimizing landing pages helps advertisers discover what serves their audience best, leading to higher conversion rates and better quality scores. Using analytical data, advertisers can uncover areas to improve, narrowing down their options of which aspect of the landing page to optimize. New landing pages are then A/B tested and analyzed for top performance. Every advertiser should work to optimize their landing pages continuously to improve overall ad performance. Be sure to use landing page optimization tools to save you time and make your life easier. Comprehensive, all-in-one landing page optimizations tools are readily available like Freshmarketer, which give businesses a single platform to optimize landing pages from all angles. Take the guesswork out of landing page optimizations and start making strategic optimizations that will drive more conversions with free plans to get you started.